In 1993 at a top secret facility conducting telekinetic research, something dangerous escaped. Now the government wants it back. Jim Thorpe, Pennsylvania, is a quiet little tourist town where nothing exciting ever happens. All of that changes when a young woman is found brutally murdered and a local boy vanishes without a trace. Fearful for his safety and led by Keenan Braddock, a clairvoyant haunted by visions of an elusive killer, a group of teenagers set out to find their missing friend and confront an unstoppable enemy. Now, years later, that same group has returned home for the funeral of a friend. Together they recount the terrifying story of their youth and a hidden secret buried deep within the past. In a time when young heroes make a stand and face off against the worst of childhood fears, J.L. Davis constructs a haunting thriller where forces converge in a battle of good versus evil, and the clock isn't just ticking. It's about to run out. A well written supernatural thriller about a group of teenagers who take on a government created terror (that is linked to one of the boys past) in order to save their friend. There are many twists and turns in this suspenseful read and the excellent narration brought the authors words to life. Descriptive scenes, short chapters, a captivating storyline and strong characters that you soon became attached to, all helped build a suspense novel that keeps you on the edge of your seat. This audiobook was provided by the author, narrator, or publisher at no cost in exchange for an unbiased review courtesy of AudiobookBlast.com. What did you love best about The 7th Jackal? I loved the way two stories intersected and met head-on to a satisfying conclusion, including the way the group of teenagers were portrayed and the corrupt and secretive workings of the government in an area 51 type of atmosphere. The description of the forest that gives the reader the feeling of being inside the story and living it. Which character – as performed by J. Scott Bennett – was your favorite? I have two. One would be Sam Cage, a government worker caught up and trying to stay afloat in a corrupt system. The other was Keenan Braddock, a young clairvoyant an unlikely hero who leads a group of teenagers against a haunting enemy. The narrator, J. Scott Bennett did an excellent job in portraying the characters. Excellent storyline. I would recommend this book for it's great plot, interesting characters and wonderful descriptions. There were so many things about this story to like. Told through the combination of present time and flashback, the story held the excitement of the children involved and stayed true to their perspective. I also loved the quirkiness of the situation. What about J. Scott Bennett’s performance did you like? Even with somewhat declining hearing, I found J. Scott Bennett's reading easy to listen to and to understand. I was particularly moved by the bittersweet ending and the narrator's carrying out his promise to his dying friend. I liked this book so much, that even though I had read it, I was looking forward to listening to the audible version. It was just as exciting the second time around. I am also looking forward to more from J.L Davis. A great listen with multiple plot threads! This story has two major plot threads, one deals with a group of kids dealing with a murderous maniac, and the other deals with the "agency" trying to track down said maniac (with another murderous maniac). The writer does a great job of bringing depth to his characters and J. Scott Bennetts narration does a fantastic job bringing those characters to life. Davis is so good, that you even begin to feel sympathy for the main antagonist! A great story and listen, well worth the credit. I was not sure what to expect because I have never read this author's work before, but I liked it very much. The story contains dark government secrets, murder and a young group of kids who put it all on the line to save their friend. The charactures were unique and the fast pace kept me interested. J. Scot Bennett did an excelent job with the cadence and all of the voices. telekinetic research years ago and something escaped to a quiet town. Someone was murdered & a boy vanishes without a trace. Group of friends determined to find him. They face terror but press on. Great characters, awesome suspense and story. read it in two days and on to the next in the series!!! given by the author in return for unbiased review. At times there is a little too much detail about the "agency's" ins and outs, I also felt like the story could have wrapped up a little earlier. I felt like the worst monsters in this book were the human monsters, what a corrupt bunch of jerks. The narrator does a decent job, I listened at a 1.5 speed, my normal speed to listen to an audio book is 1.25. Was The 7th Jackal worth the listening time? Yes, but I think I would have been better served at having a hard copy of this book, sometimes I had to re-wind to get all the details that were flying around. So creepy! 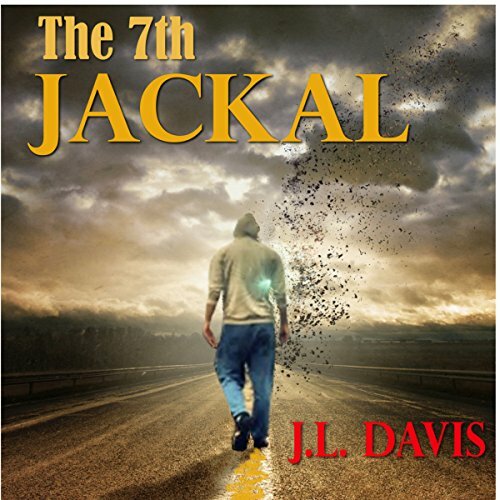 The 7th Jackal is a supernatural thriller involving a group of kids, hoping to save their friend from "the dark man" but the dark man isn't the only bad guy in this one, Mr. Grimm is a disgusting, vile excuse for a human. I like that I didn’t figure everything out right away. The seventh jackal was a terrifying tail. That lead you in many directions. I loved every minute of the ride. If you could sum up The 7th Jackal in three words, what would they be? What was one of the most memorable moments of The 7th Jackal? The confrontation between the kids and the "monster" on Pisgah mountain. Have you listened to any of J. Scott Bennett’s other performances before? How does this one compare? Yes, he delivers as always! Both, it was very well written and induced various emotions throughout. I enjoyed this novel I didn't have to struggle to finish at all the most memorable was when the truth cane out about who the father was to Keenan. The narrator was nice to listen to.